This name uses Eastern Slavic naming customs; the patronymic is Borysovych and the family name is Groysman. 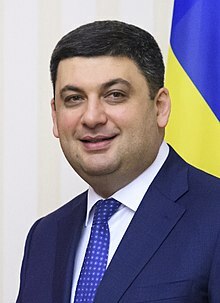 From March 2006 until February 2014 Groysman was the Mayor of Vinnytsia. From then to November 2014, he held two concurrent positions as the Vice Prime Minister of Ukraine for Regional Policy and the Minister of Regional Development, Construction and Housing and Communal Services of Ukraine. He was elected into parliament on the party lists of the pro-presidential Petro Poroshenko Bloc. Groysman's next post was the Chairman of the Verkhovna Rada (Ukraine's national parliament), starting late November 2014 until being appointed Prime Minister. Volodymyr Borysovych Groysman was born in Vinnytsia on 20 January 1978. His father, Borys Groysman, is a businessman and a local politician. Both of Volodymyr Groysman's parents are Jewish. In 1994 he started his career as a commercial director of his father's small private business company "ОКО" and as a commercial director of the private enterprise "Youth". In the 2002 local elections, he was elected as a member of the Vinnytsia City Council from the 29th electoral district. In the city council, he worked as the Deputy Head of the Permanent Committee of the City Council on Human Rights, Lawfulness, Council Members' Activities and Ethics. In 2003, he graduated from the Interregional Academy of Personnel Management with a specialty in Jurisprudence. In 2004 Groysman joined the party Our Ukraine. In February 2010, Groysman graduated from the National Academy of State Administration with a specialty in Community Development Management, especially management on the local and regional levels. On 27 February 2014, Groysman was concurrently appointed as the Vice Prime Minister for Regional Policy and the Minister of Regional Development, Construction and Housing and Communal Services of Ukraine in the First Yatsenyuk Government. During this period, Groysman was appointed the chair of the Ukrainian Special Government Commission on MH17, investigating the shootdown and crash of Malaysia Airlines Flight 17 ("MH17"), during the War in Donbass. The parliamentary coalition that supported this government collapsed on 24 July 2014, and on the same day, Prime Minister Arseniy Yatsenyuk announced that he was immediately resigning from his office. However, Yatsenyuk's resignation was not accepted by parliament. Nevertheless, on 25 July 2014, the Yatsenyuk Government appointed Groysman as its acting Prime Minister. However, on 31 July 2014, the Verkhovna Rada declined Yatsenyuk's resignation because only 16 of the 450 MPs voted for his resignation. In the 2014 parliamentary election, Groysman was elected into parliament after being in the top 10 of the Petro Poroshenko Bloc's electoral list. On 27 November 2014, at the first session of newly elected parliament, Groysman was elected as the Chairman of the Verkhovna Rada. 359 (of the 423 deputies) supported his nomination. He was also the only candidate for the post. With public dissatisfaction and allegations of corruption surrounding his government, Prime Minister Arseniy Yatsenyuk announced on 10 April 2016 that he planned to resign. Following several days of parliamentary debate, on 14 April 2016, Groysman was voted in by MPs 257 to 50 as the 16th Prime Minister of Ukraine. Groysman is the youngest Ukrainian prime minister ever (age 38 at election). Groysman's selection as PM triggered a constitutional requirement for a new Cabinet, in which new appointments were already forthcoming due to resignations in protest over Ukraine's corruption and reform issues. Some of the posts in the new Groysman government were assigned to people who were perceived as Poroshenko allies. Groysman has indicated he would fight corruption and build closer ties with the European Union, which has complained about widespread and pervasive corruption in Ukraine's government and economy. ^ a b "Analysis: Choice of Jewish PM undercuts long-held accusations of state anti-Semitism in Ukraine". The Jerusalem Post | JPost.com. Retrieved 2018-05-17. ^ a b "Jewish Wunderkind Turned Ukrainian Prime Minister - Who Is Vlodymir Groysman?". Haaretz. 2016-04-14. Retrieved 2018-05-17. ^ a b c "Marking end to spat, Netanyahu meets with Ukraine's Jewish premier". Retrieved 2018-05-17. ^ a b "Ukraine MPs approve Volodymyr Groysman as new PM". BBC News. 14 April 2016. Retrieved 14 April 2016. ^ "Mayor Volodymyr Groysman described the reception..."
^ "Who's who of the Council of Europe Congress - Individual Member data". ^ JNi.Media. "Meet Volodymyr Groysman, Ukraine's Jewish Prime Minister". Retrieved 2018-05-17. ^ "Ukraine Prime Minister Resigns, as Kiev Moves Toward Elections". New York Times. Retrieved 24 July 2014. ^ Kramer, Andrew E. (2016-04-14). "Volodymyr Groysman Approved as New Prime Minister by Ukraine's Parliament". The New York Times. ISSN 0362-4331. Retrieved 2016-04-16. ^ "Володимир Гройсман отримав державну нагороду Республіки Польща"
^ Указ Президента України від 26 червня 2008 року № 584/2008 «Про відзначення державними нагородами України» Quote: "За вагомий особистий внесок у розвиток конституційних засад української державності, багаторічну сумлінну працю, високий професіоналізм та з нагоди Дня Конституції України "
Wikimedia Commons has media related to Volodymyr Groysman. "Leader of the Verkhovna Rada of Ukraine". Official portal (in Ukrainian). Verkhovna Rada of Ukraine. Retrieved 22 December 2014.